You've got to love a game which is smooth, fast, beautifully presented - and which helps you learn at the same time. 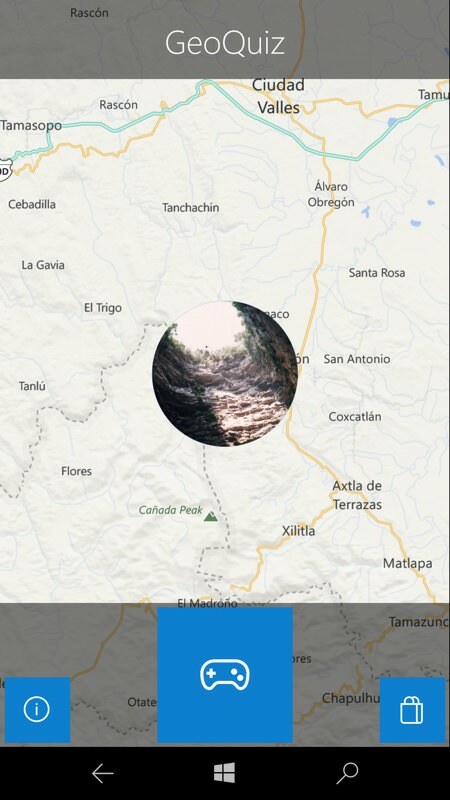 As the title suggests, GeoQuiz UWP asks you to locate people, attractions, brands and sights on the Earth's surface. As accurately as possible, by dragging around a marker and zooming in as needed. There are over 300 things to locate here, with algorithms building in how you did in terms of location and time taken to do so - it's harder than it looks! This plays nicely on all Windows 10 devices, though I'm only looking at the game on phones here. 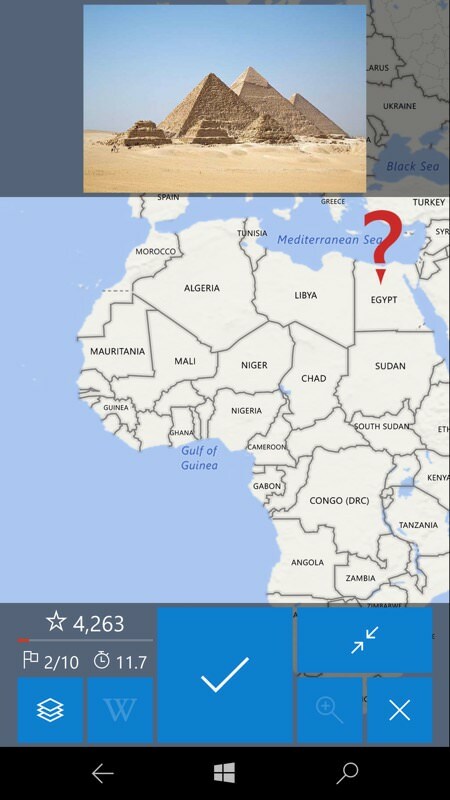 You'll need a good knowledge of geography and trivia to really get anywhere though - hence the educational aspect. Although targets to 'find' are in a different order on different 'runs' through the game, you'll learn (where they are) as you go along, to some extent. 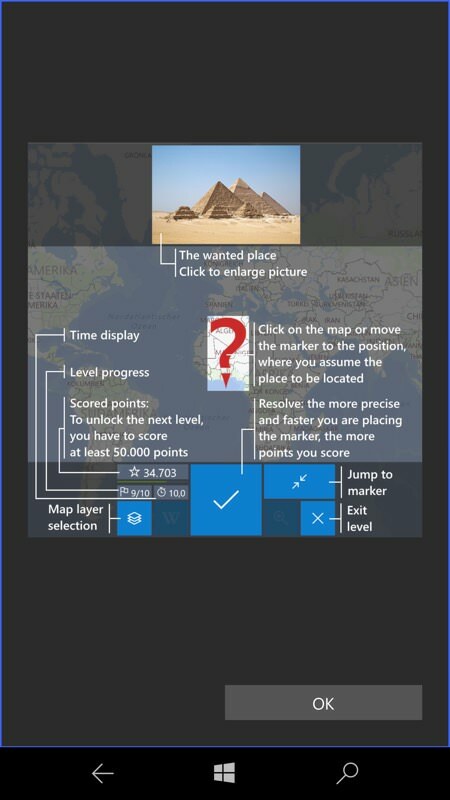 The interface is super slick, as you'd expect from a master of Windows 10 apps, including of WorkingHours, SpotBright and Diarium. The menu is an animated demo of the interface, with the help screen above right in case you're puzzled. Then it's a case of diving into the game and working your way through all 300 puzzles (in packs of 10), pinching and zooming and panning as needed, then dragging the pointer below the question mark to where you think the item to be found is. Once you're happy and hit the tick, the amount you're out is taken with how long you took to find the item (no cheating, so presumably the timed aspect is to help stop you looking things up on another device! ), with the algorithm converting all this into points. And what do points make? Prizes. Admittance to the next level/puzzle pack! Or you can use one of the very cheap in-app-purchases to gain full access to all packs (and perhaps to zap the inter-level pack video adverts). Normally, you have to get to 50,000 points to advance, but this isn't super-difficult, especially on the second run through. 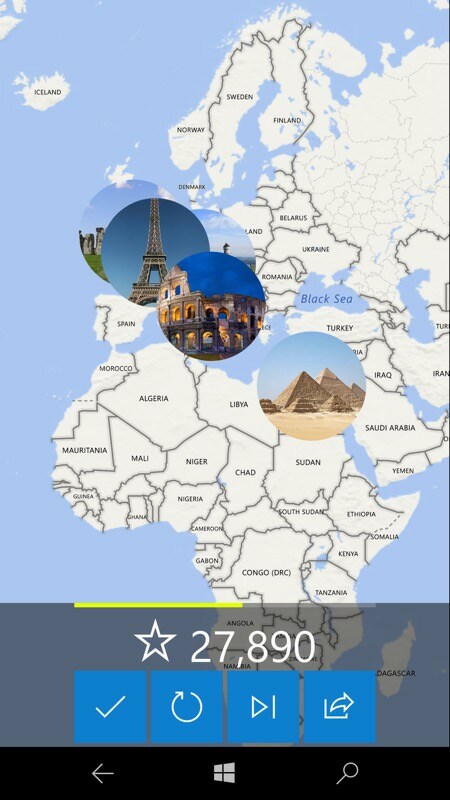 But then GeoQuiz isn't about trying to be impossibly tricky, it's supposed to be challenging and to help you learn a little geography along the way. 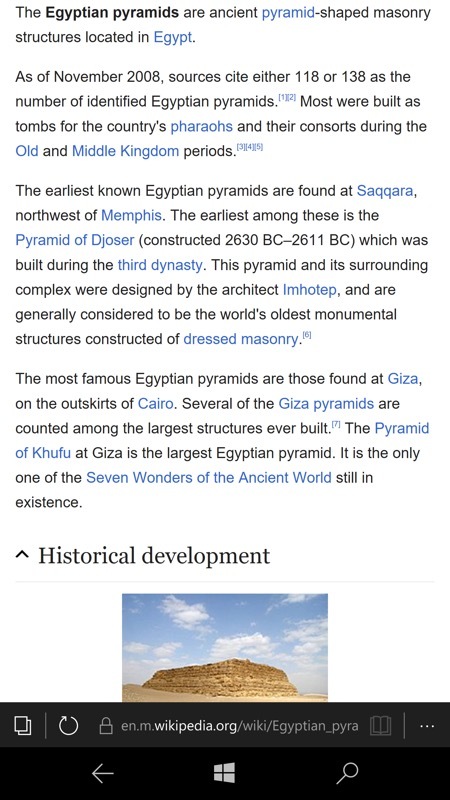 In fact, you can go further and, after finding something, the Wikipedia link lights up and you can tap through to find out more about whatever you were trying to find. 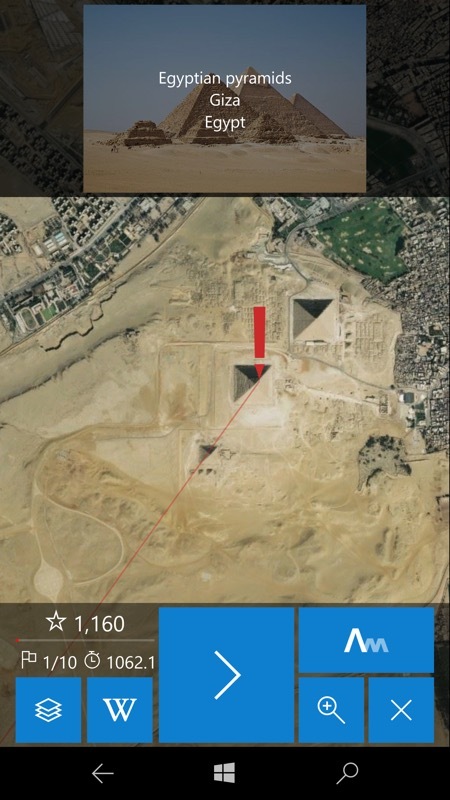 Also note from the screenshot below (right) that you can cheat a little in some cases by switching the map to any of the other Windows 10 Maps views, including 'satellite' - making accurate location of the pyramids trivial, though the time taken to actually pan around and find them may count against me here. Ah well. All part of the GeoQuiz UWP fun! A super little game and a no-brainer for ad removal and supporting the developer in a small way. PS. The developer does tease 'Pro features' - I wonder whether these are still on the way? 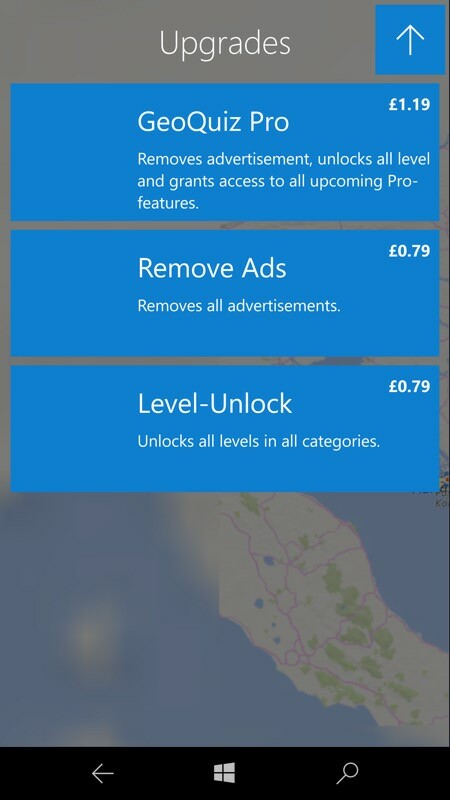 Hopefully enough people use the IAPs to make further development worthwhile!